Random thoughts on books, quilts and life! Deb Brandon shares her story to educate and call attention to Cavernous Angioma. Cavernous angiomas are vascular lesions comprised of clusters of abnormally dilated blood vessels. What that description doesn't tell you, but Deb does, is the impact that condition has on the body and the daily struggle to lead a relatively normal life. After three surgeries, rehab, and battling depression, Deb clearly chronicles her journey and the emotional toll that all of it had on her and her family. The descriptions of the paralyzing effects of her experiences in a crowd situation are absolutely mesmerizing. Her fear is clearly evident and at the same time, her determination to recover and continue teaching as a professor in the Mathematical Sciences Department at Carnegie Mellon University is inspiring. Prior to reading this book, I had not heard of this condition, so I included two websites to help educate you too. How Deb survived and thrived is beyond comprehension and at times unbelievable. If you like memoirs, you won't be able to put this one down. I received a copy for a review. Deborah Brandon, PhD has been a professor in the Mathematical Sciences Department at Carnegie Mellon University since 1991. She has participated nationally and internationally in dragon boating. She is a mother, a writer, and a respected textile artist, as well as a brain injury survivor. 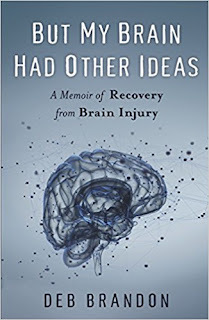 Brandon is an active blogger and regularly participates in social media platforms, including Facebook, where she discusses brain injury and its impact, and Twitter, where she posts observations about the sometimes absurd, sometimes bizarre, and always intriguing world of long-term brain injury survivors. Follow Kathy's board Quilt Retreat on Pinterest. 2013. Simple theme. Theme images by Deejpilot. Powered by Blogger.